I think it only fair that I provide warning that over the next few weeks I will revisit ideas and decisions again and again. This may be an incredible bore to you, but I won’t apologize. It is a necessary part of the process and refinement of any design. The living room will provide just such a challenge. It is already quite a nice, with excellent light, and still, no doubt improvement can be made. Each owner must do their part to care for and enhance the property. The folks that live there now certainly did with a major renovation to the rear of the unit. They raised the dormered roof line, creating full height usable space. A tremendous effort and added value. I too will do my part. So back to the living room we go. I am now convinced that a curved wall will add so much visually to the room, while providing much needed storage space. Suitcases, vacuums, brooms, coats, you name it. They all need a place to reside outside the eye of those that live in and visit the home. Nothing is more disconcerting in a small space than clutter. You know the rules – mise en place….EVERYTHING IN ITS PLACE. By beginning the wall at the first hard line within the window bay, and extending it beyond the installed cabinetry (which would be removed) to the edge of the wall and ceiling. This would create a gentle, but noticeable curve, accommodate a 2′ disappearing door, and still bestow the owner with a display opportunity via the bookcase at the end of newly installed wall. Some type of built in cabinetry will need to be designed for the right side which abuts the kitchen. This side cannot be addressed in the same way, so I am thinking about a custom buffet, perhaps designed with cabinet doors utilizing the same material as the wall. 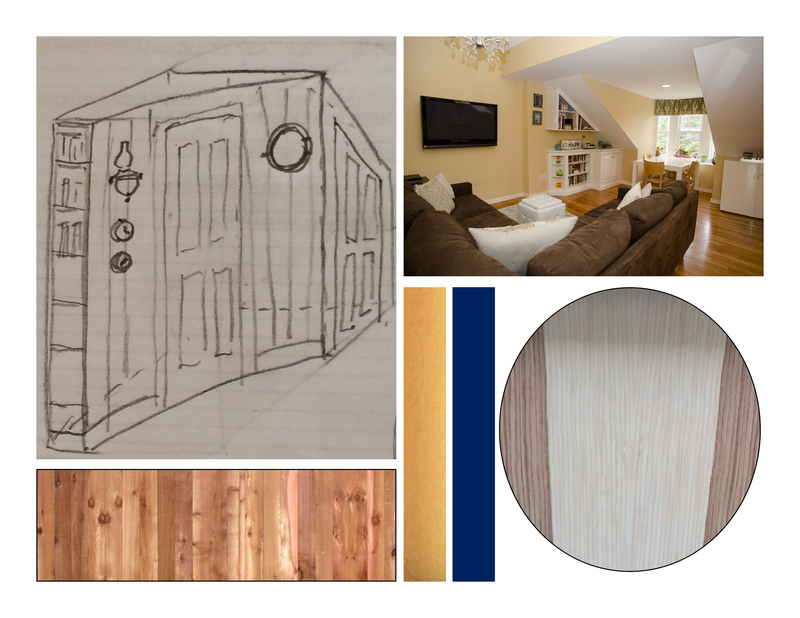 Right now in play is a beautiful wood veneer that would pick up the hues of the oak wood floors and kitchen cabinetry. If I go with the navy design it will be necessary to buy new furniture. I’m afraid I’m going to have to open my own retail store with all the furniture I am collecting in pursuit of my crazy design plans. Other alternatives include cedar planking, a plastered wall which will later get painted (perhaps not as much fun, but definitely more cost effective) all must be given serious contemplation. And so I will. Bare with me. I hate it when I make a mistake. « Inspiring Minds Want to Know: Which way will this design go?